R & D: Let's go to Andy's Workshop! "My Motto: It's in here somewhere!" This is where you will find the bits and pieces of past projects. picture to see it in greater detail. I walked into the AutoZone for muffler clamps, and there they were! Cool plasma-neon tubes, regularly $24.95, on sale for $2.00 each! (Who could resist?) 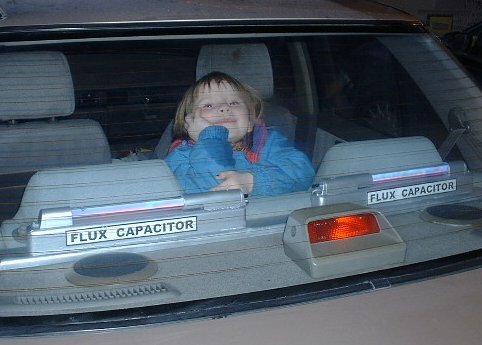 Suddenly, my parts demanded a project, and what better than Doc Brown's time-traveling necessity, the flux capacitors? I built the rack from scrap wood, and wired the tubes into my car's running lights. Once again, I am in on one of the world's greatest inside jokes. The attractive model is my youngest daughter Katie, who thinks the tubes are so cool! 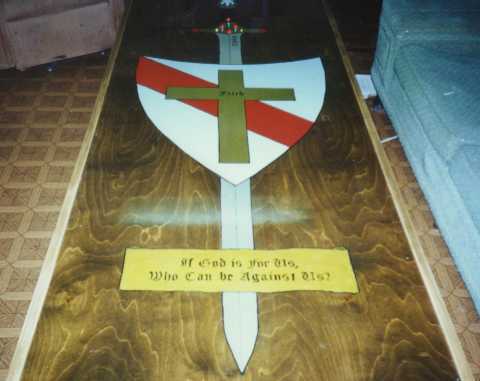 This project came about after a 2003 trip to the Ohio Renaissance Festival. They had a dozen game booths, from "Drench the Wench" to axe-throwing, but there was a tiny "Shooting Gallery" that used pistol-type Ping-Pong Ball crossbows. Really crude design, but a cool idea...and the gauntlet was thrown down. "Wouldn't it be cool," said I, "to make a full-size crossbow, fairly accurate to the middle ages, with Ping_Pong ammo?" I did a network search, and found By The Sword, a cool site where you can go buy some pricey faux-authentic crossbows. I mimicked the simplest design, and voila! It shoots about 30 feet with fair accuracy. 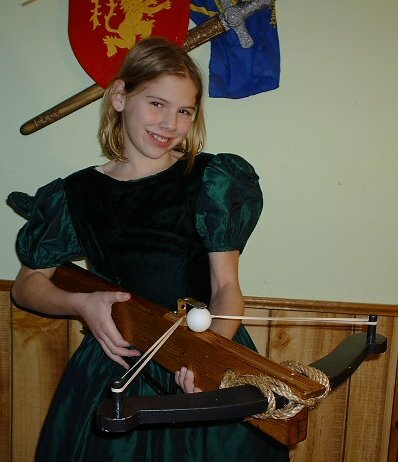 The crossbow model is my daughter, Bethany the Pirate Princess. "Doctor Who?" you say? Exactly. This unassuming British Police Box is the exterior of the good Doctor's timeship, the Time And Relative Dimensions In Space vehicle. In the ageless BBC action-adventure program (you say "children's program" and I shall send you a nasty email!) the alien Doctor travels from the beginning of time to the End Of It All in this amazing device. Oh, well, all right. Not in THIS one exactly. This is a four-foot-tall video tape box I built from cheap white pine six years ago. The original was $400 from some insane fan organization, and hey, in that way I have, I said: "Shoot! I can build one of them for under a hundred!" (And I did.) Two others exist, in the hands of my brother Jim and my Best Buddy Jay. I stained and varnished the interior, and painted the outside cornflower blue, just like the original. The "jelly-jar" light on top is the plastic from a cheap bottle of Kroger "designer" water, and thanks to a 555 timer chip, the roof-top light flashes when you open the door. 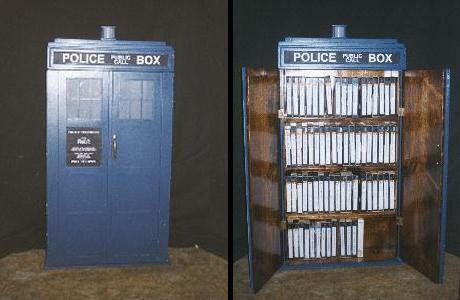 And no, sadly it isn't bigger on the inside than the outside like the original! This was a major modeling project I did about ten years ago. 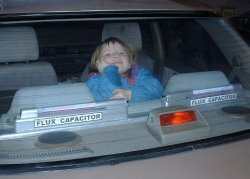 The portholes are lit with fiber-optics, and the running lights, strobes, tractor beams and impulse engines are all LED-driven. The blue glow of the engine nacelles is particularly cool. No bulb or tube would glow evenly, so I found a company called Lightsheet Systems that makes a special glow-sheet that you cut with scissors. A tiny transformer in the model takes 5V electricity and steps it up to a low amp, high output supply that drives the fluorescent sheet. This picture doesn't do the effect justice. Looks just like neon in person, though. This one dates from 15 years back, with the same techniques. A 555-chip timer drives a pacing circuit to make the inside surfaces of both engines strobe properly. Impulse engines are two similar LED timer circuits wired slightly out of sync, and another timer drives the LED's for the running lights. I made this for my eldest daughter, and loan it out every year to the summer camp at a local daycare. Using the same techniques found on Tron's Game Grid (my MAME arcade box), I built this simple controller as a plug-in to a computer. Includes sloped wood case, an arcade quality trackball/mouse, one player joystick and arcade buttons. The guts of the joystick are wired to a cheap Gravis 4-button controller, while the actual stick and buttons are from Happs Controls. This was made in 1976 when I was working on the first draft of the Tri-D Chess rules. It is accurate to the original Starfleet Technical Manual design, which means that you can invert the attack boards (unlike some of the cheaper boards you will find at SF con's today.) It features a metal rack and lathe-turned walnut base. The three main boards and the four smaller attack boards are clear, 1/4"-thick Plexiglas, and the red squares are spray painted on the clear plastic. Fully playable with the up-to-date, modern form of the game, the Federation Standard Tri-D Rules. URL: http://www.yestercade.net/console/workshop.htm < Love That Email!